My mom made me throw some of my old troll dolls in the trash yesterday. Now who’s the monster!?! I am. Anyway, I am still feeling pretty guilty from that. I hope those poor giblets realize I never stopped believing in them, but for the fact that their hair was getting untenable. Also I don’t think it counts as emotional eating if your food has no expression on its face and neither do you when you eat it, right? Yeah, let’s go with that for all future guilt assessments. I only like to eat chocolate if it’s shaped like a remorseless face, emphasis on morsel. I also realized recently just how much I love Tom Robbins. He is an author that makes language shimmy so that all of his words are like whirling dervishes on the playground at recess. And he’s a notoriously private person, which I immensely respect. This has been all over the place, just like life. **And ostentatious drama actually makes me quite uncomfortable, not riled up and amused, but that’s why I find it so fascinating. I am like a robot studying yoo-man beings. It’s also why I have trouble with acting because I don’t emote as freely as most of you normals. So regular expression of my psyche feels like a caricature of what I’m supposed to be doing anyway. So when I’m actually faking it, I feel like I’m double acting. Cyborgs unite! We will master this species yet. Prolific Rapper Is Not Daunted by Legumes, No Sir! I miss my troll dolls too. The went away five years ago, not by my choice. They were one of the few things I had saved from my childhood. I had three regular ones, two big ones (male and female, judging by the hair) and two horses. 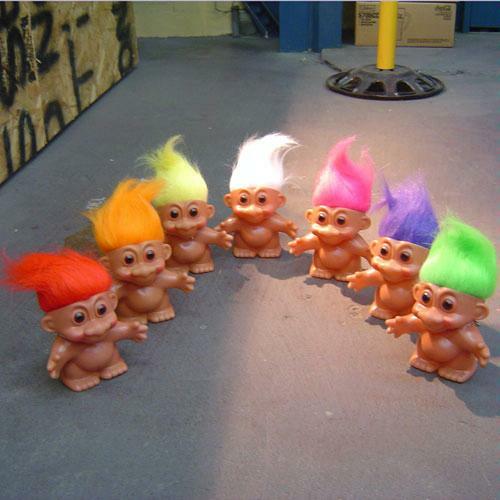 I was way into troll dolls even though everyone else on my block played with Barbies. Yours are very cute with their brightly colored hair. Sorry you had to let them go. Aw! I just linked to some random ones; mine were way tinier, but the pain is still real! Thanks for writing and I'm sorry about your dolls too, Cyndy! Wait, troll horses?! I had no idea! HOLD YOUR TROLL HORSES! WHAT? !